The then Monarch of all Russia, Tsar Nicholas II, had been invited to stay here on the Sandringham Estate with King Edward VII. Having taken part in various shooting parties, it was decided on this occasion they would take a walk together through the estate. King Edward persuaded his guest to leave behind his bodyguard. “I don’t use a bodyguard around here and you won’t need one either”, said the King. After walking what seemed several miles, they realised they had lost their way. Walking on, they eventually came upon a horse drawn cart making its way along a muddy track; on approaching the driver for help, he informed them that he was not going in the direction of Sandringham but would gladly give them a lift to the station at North Wootton. 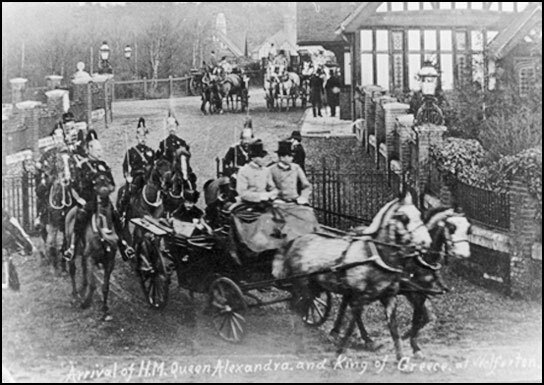 “From there”, explained the King to his guest, “It is only three miles to Wolferton and upon arrival I can then send for a carriage to collect us”.